It's one thing to do 260 miles on a motorway, that's easy. We covered about 140 miles of "A" roads yesterday, that's no great hardship. We could follow the shortest route from Carlisle to Tummel Bridge today and cover 180 miles. We could. But then...should we? Firstly it will be 180 miles of mostly traffic, towns, countless junctions and ordinary roads. There's 4 of us in the posse and keeping 4 riders together through endless traffic lights and roundabouts is difficult. The route is complex. 180 miles is do-able but it's going to be a hard ride. There is another option. We could, perchance, head north west up to the Ayrshire coast and catch a ferry across the mouth of the River Clyde. I've always wanted to see the "Electric Brae" and this would be a good opportunity. I don't know the coastline around that area either although I expect it will be either industrial like the mouth of the River Mersey or tacky holiday style like Blackpool. If we catch the ferry across to Dunoon at least we'll miss all the conurbations around Glasgow and Edinburgh and we'll be on the excellent Highland roads. There is a downside though. 260 miles. RG and I look at the weather. The weather forecast looks fair, mostly dry with some cloud. Can we trust the weatherman? RG makes one simple comment that concretes the decision in my mind. "If we don't do it, we'll regret it." It's such a simple thing to say but to hear it makes me remember all the reasons why I ride a motorcycle, why I want to travel and what life is all about. Looks like we're heading north west to the Ayrshire coast then. 0900, that's when the girls have agreed we should be ready and on the road. Yeah, right. The gf is the queen of procrastination and delay, she has no concept of time whatsoever. She doesn't do mornings either. There's more chance of hell freezing over than to see her sat on the bike, engine running and ready to go by 0900. I expect JR will be much the same, I'm cynical like that. So to see both ladies putting their helmets on and starting their motorcycles at 0900 means I have to eat my words. I'm pleased we're all ready on time but this humble pie doesn't half stick in my throat. We hit the road at 0905, I shall cling to those 5 minutes as proof of my prediction. Unfortunately we don't really hit the road. We need to dine and after last night's disappointment at the restaurant we're loath to use the expensive and slow restaurant attached to the hotel. So it's off to Morrisions for food and supplies. Supermarket cafes are as dull and predictable as tap water yet also equally essential and safe. We dine, buy sandwiches and drinks for later and fill up with fuel, all in the same place. 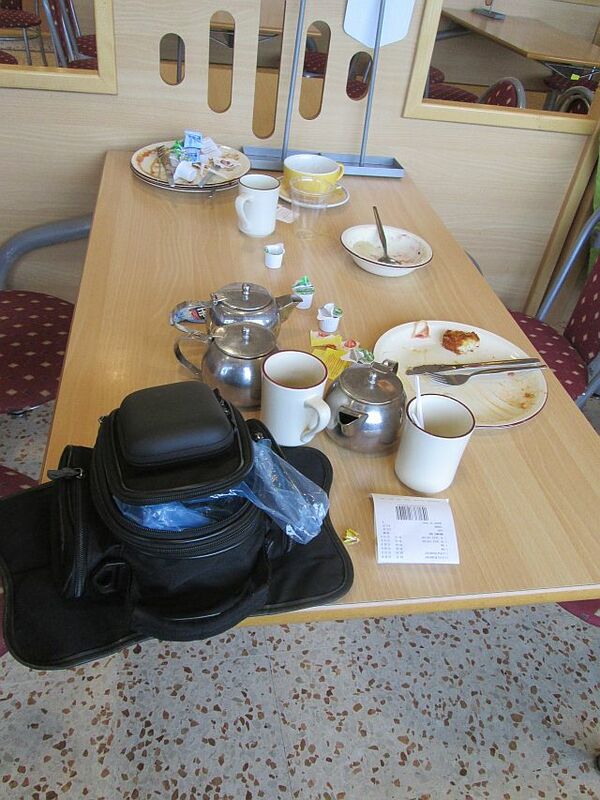 Breakfast at Morrisons, not Tiffanys. The road to Dumfries is ordinary and uninspiring. I guess the rest of the trip up along the Ayrshire coast will be much the same. This isn't the Highlands where the real beauty is, this is southern Scotland which is just like England. 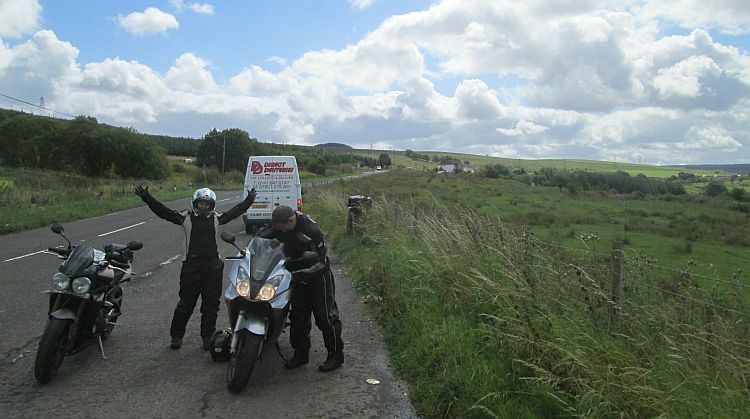 There's over 100 miles to the ferry and the only thing to look forward to is an optical illusion at the Electric Brae. I plod on at 55 mph, monitoring the gf's progress on the 125. Head down, press on, ride, get the miles done and get across to the Highlands. This is transport. This is just moving from one point to another. The A75 takes us to Crocketford where I know we need to turn right onto the A712. I take the turning and find myself no longer on the main "A" road but a quiet empty countryside lane. Ooooh, corners, this might be a little more interesting than I thought. Oh my, this is fun! Oh that's a grippy curve, there's an excellent sweeper, whoa! Now it's a sharp gnarly twist. The road undulates and squirms its way through the countryside and the surface is made of dry sticky glue. I have to back off every three or four bends to allow the gf to catch up a little. She's doing just fine but I have the upper hand in power and experience. I can see JR and RG behind her, I wonder if they're loving this road too? We wiggle and shimmy our way to New Galloway and pick up the A713 northbound. This road is not quite as delightful as the A712, it's broader and a little busier. This gives me time to take in my surroundings. This is not the Highlands this is rural countryside suitable for crops and cattle and that is what fills the fields. I'm enjoying the roads and the ride today but I still look forward to the real mountains and lochs. Each mile brings me closer to them. It's been 2 years since I was last there. I hadn't realised how much I was missing them. That said, I'm starting to gain an appreciation for southern Scotland too. While RG and I try to find a route...JR is just being silly. At Patna with the help of Google Maps and RG's Sat Nav I find a turning to Maybole. 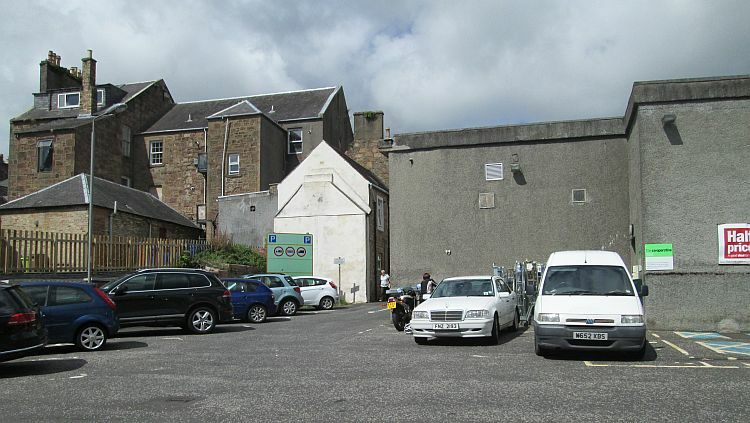 Maybole reveals a small pleasant town, a car park behind the Co-op and a cafe on the main road. We drink hot tea and rest a while. An aged lady engages me in conversation, curious as to our purpose and where we are from. It's hard to understand her thick Scotch accent but this makes me feel like I'm truly up north and on holiday. It's not all rural beauty and fabulous roads you know. It's Co-Op car parks too. It's time to find the Electric Brae. I give RG instructions to turn left at the sweeping bend. This is lost in translation far more than any Scottish accent. I mean a corner that is not a sharp corner but a large curved corner, off the main road. RG on the other hand is thinking of a long sweeping bend to the left. We leave the car park separately with our respective partners. I take the corner, RG heads out of town looking for my sweeping bend. Damn. And Blast. We wait, I have no idea what has gone wrong. It's not a safe place to wait so we carry on. He know's where we are going so we'll meet them at the Electric Brae. We ride along the country lanes and I flap just a little about being separated. Suddenly the sea comes into view and the scene before me replaces any nonsense stress. It's a novel scene, the rolling farmland falls away to the deep blue ocean then an island, all craggy, mountainous and wild can be seen far across the bay. It's a fascinating and interesting contrast. I can see the Electric Brae is coming up, a sign warns to watch out for slow cars ahead. I prepare myself to be amazed and disorientated. In fact...I experience nothing, only noticing I'm at the Brae as I recognise a stone marker in a layby. I slow to see if I notice anything, nope, nothing. In fact I hardly can tell I'm on a hill be it up or down. I'm reminded of the disappointment of the Magnetic Hill in the Isle Of Man earlier this year. Should I stop to see if I can notice the effect? Nah, can't be bothered. However just around the corner I'm forced to stop by the beauty before me. 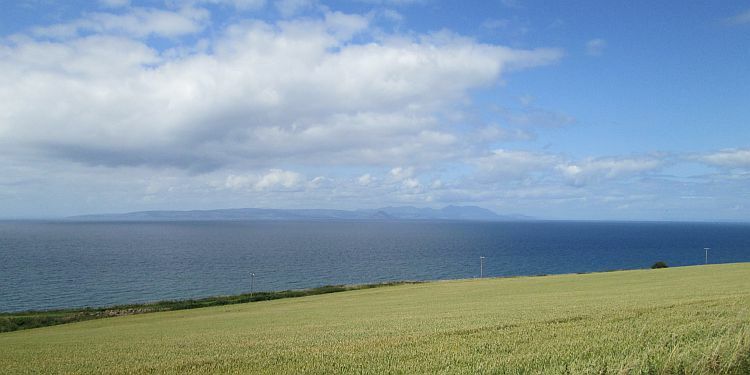 A field deep in wheat or some similar crop falls smoothly down to the hidden shoreline and across the calm waters what I think is the Isle of Arran. Arran pokes sharp hills into the light clouds across the horizon. It's a little breezy but the sun is out and I'm warm, dry, comfortable and longing to get closer to those Highlands. What I think is the Isle of Arran in the distance. The spell is broken when I receive a vague call from RG, we are both confused as to where we are and the reception at either end is not good. It takes 10 minutes of dropped calls, Sat Nav, Google Maps and frustrated answerphone messages before we work out he's south and I'm north on the same road. What a pair of muppets we are. RG and JR eventually join us in the layby and by this time a young chap on a Bandit 600 has stopped for a smoke. He's local and only just passed his test and got his 600. Fran is a lucky man to be mastering his riding skills on these wonderful roads amid this scenery, better than the gritty wet streets of Greater Manchester. Good luck Fran, take it easy (but not too easy eh). The Ayrshire coast is proving to be a revelation. It's not industrial nor filled with arcades, it is pretty, quaint and lined with small towns that feel relaxed. Old white houses with multiple gables are mixed in with smart modern designs that, for the most part, compliment the older style. We stop for a pee break in the town of Inverkip and while it's not all rural beauty I'm starting to get that Highland feel. Just poking out across a small bay I can see trees and hills and Scottish houses nestling by the shore. It's lovely. There's a ferry coming up soon. 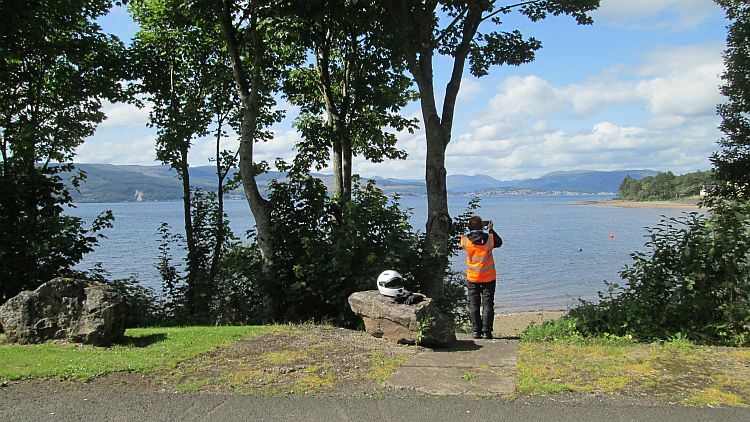 The gf snaps the beauty of the surroundings at Inverkip. RG and I almost drop another clanger. RG's map shows a ferry from Port Glasgow and that's where we are heading. Further study at the Inverkip pee stop suggests this might not be the case. Google Maps shows Gourock has ferries, we'll head there. I find the turning and a few miles later I spot a ferry terminal This...this is the "McInroy's Point" terminal that runs to Hunters Quay, Dunoon. This isn't really the one we want but...but I don't want to ride to the other one only to return. We pull in and RG heads off to ask one of the deck hands what the script is. It's lucky I pulled in, the ferry from Gourock is for foot passengers only and according to the official looking bloke this is the only way to get our bikes across the water. I wonder if this is the truth and not a ploy for more customers, but I'm in no position or mood to find out. The ferry is almost full as we ride aboard and before long we're off into the estuary, or is it a loch, or a bay, or a harbour. Oh hell I don't know. I do know I love ferries. It's a childhood thing. There's me, on my bike, on a boat, on the water. It's like a Russian Doll, me on a thing on another thing on the unusual thing. I can't explain properly but these open ferries are the best. It's like a moving piece of floating road. This one is extra special as the views are everything I could hope for in a Highland scene. Small towns hugging the shoreline, vast open waters with a tanker to set the scale, vast empty mountains in the distance and the epic sense of space coming towards me. Wow! Now that's what I call space to breath. Space. No, silly, not the final frontier, space to breath, space to move, space to ride. I live in Bolton. Bolton is on the edge of Greater Manchester. Liverpool is about 30 miles away, Preston 15 miles, Blackburn 20 miles, Leeds and Bradford maybe 50 miles or so. We have countryside like The West Peninne Moors but this is a mere tiny patch of green. 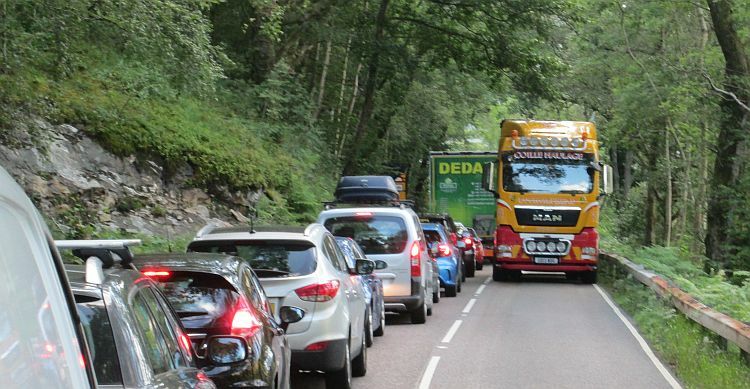 The Trough Of Bowland, The Peak District, The Yorkshire Moors and The Lake District are all beautiful but crammed full of tourists, bikers, holiday makers and Uncle Tom Cobbly and all. London may be the capital but the M62 Corridor is where most of the people live, squished and squashed into the narrow streets of the Industrial Revolution. I can feel the space to breath ahead. I am not let down, not at all. We alight from the ferry and a right turn sees us following the coast of Holy Loch northbound. There's a little industry here, a rickety narrow pier leads into the lock, it's purpose unknown but it looks purposeful. This doesn't detract from the manicured gardens in front of the houses that contrast sharply with the wild hillside forest behind them and across the loch. This feels like the Highlands now. The traffic has thinned out too and I feel vacant clean air fill my lungs. I'm home. It is a matter of minutes before we are deep into forest, loch and glen. I'm frustrate myself because I can't find the language to express how it feels to see Loch Eck (Eee by 'Eck, there's a Yorkshireman by Loch Eck) through the trees that line the roads. I've seen Scottish beauty before, I know what this place is all about, so why am I getting so emotional and overjoyed to see a loch in a valley, some trees and a few hills? We need to press on, it's tea time already and there's still 90 or so miles to cover. The thing is I know those 90 miles will pass far quicker than 45 miles back home in the busy, traffic lighted, be-roundabouted, congested, bustling and cramped streets. Taking a break to eat sandwiches on a Highland layby. Except for Loch Lomond. Loch Lomond is indeed a peach of a loch visually but it's proximity and accessibility from Glasgow and Edinburgh make it a tourist trap. We leave the quiet roads and join the ribbon of vehicles winding their way along the shoreline. This overcrowded road is in perpetual repair or expansion and the obligatory traffic lights and road works give us all time to rest and take silly pictures. Fortunately this glitch doesn't last long and soon we're on the A85 from Crianlarich. Loch Lomond, not like this in the brochures is it! The gf and I can both easily cover 250 miles on a tank, JR's Street Triple is a little thirstier and by 130 miles she suggests some fuel would be nice. I find a petrol station. While I revel and cherish the remote and wild spaces the Highlands have to offer there is a downside. This lonesome petrol station late on a Sunday evening is firmly closed, that wouldn't happen in the sprawling metropolis would it. It's not a major issue, if the worse comes to the worse we can drain some from the other bikes and there's only 30 miles left to ride. The last 10 miles sees us take on the B846. This is narrow, up hill and down dale and it gives me the feeling it's not used very often. There's loose gravel in unpredictable patches to catch us out and corners that sneak up on these weary travellers. We've covered almost 260 miles at 125 speeds and on minor roads. We're tired and this road is testing us, much as I love my surroundings and this space I'm relieved to see the holiday park come into view. We are late, it's well after 1900 and reception is closed. RG, ever calm and efficient, retrieves the key to our caravan from the bar, smart lad. The caravan is exactly as I'd expected, which is a good thing. Clean, large enough for 6, furnished and perfectly acceptable. We lob our gear into various rooms and start to make ourselves at home. It's been a hell of a ride. I have been pleasantly surprised how welcoming the Ayrshire coast had been, I'd not been expecting that and the gf agrees it's definitely worth exploring further. It feels good to be out of the rat race and into the vast spaces of the Highlands. I've been impressed how well we've all ridden and how we've all kept our spirits up even towards the end as we got tired. As we sit and drink pop in the on-site bar I feel a sense of achievement, 260 miles is good. The weather's been on our side today, let's hope it stays that way. You only seem to be adding the silly photos of me!